What best describes Nathan … is his Robin Williams meets Mister Rogers persona – a natural-born character actor with a warm and friendly personality. A voice actor who is not just another voice, but an actor who cares about the role he is playing. Whether the character is the “guy next door” or the “alien visitor from beyond the galaxy”, he wants to help you to tell the story by giving heart and soul to every word. Description of voice: A natural tenor with a wide vocal range, able to create multiple character types, everything from child voices to believable elderly female characters. Character Acting Able to create a wide range of character types in many age ranges. Improv Acting with improvisation is literally second nature. 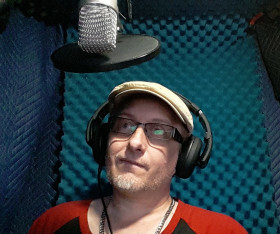 Voiceover training with Voice Artists United VAU Mic Check Attended workouts with Voice Artists United trained and graduated and now work side by side with Michael Montes the founder of The Mic Check VO Workout. Trained with Angel Burch of Angelic Voices. I have worked and trained in voiceover with Angel Burch of Angelic Voices.